If anyone is interested in understanding John MacArthur’s position on Mark Driscoll you can read about it here, but as far as his position on Piper’s invitation to Driscoll to appear and speak at his 2008 Desiring God Conference…well…only time will tell. “Worldly preachers seem to go out of their way to put their carnal expertise on display—even in their sermons. In the name of connecting with “the culture” they want their people to know they have seen all the latest programs on MTV; familiarized themselves with all the key themes of “South Park”; learned the lyrics to countless tracks of gangsta rap and heavy metal music; and watched who-knows-how-many R-rated movies. They seem to know every fad top to bottom, back to front, and inside out. They’ve adopted both the style and the language of the world—including lavish use of language that used to be deemed inappropriate in polite society, much less in the pulpit. They want to fit right in with the world, and they seem to be making themselves quite comfortable there. See part two by clicking here. On a recent vacation, my wife and I spent a day in Boston visiting some interesting historic sights. The Old South Meeting House, where we stopped first, was a Puritan church building. (The Puritans never called their buildings churches, as they recognized that the church is the people who make up the body of Christ.) The building held many types of meetings with a variety of famous orators, including George Whitfield. It’s most well-known, however, for the meeting in which 5,000 colonists gathered to discuss the British tax on tea. When Samuel Adams gave the pre-arranged signal to begin the tea party by saying, “This meeting can do nothing more to save the country” the Sons of Liberty stormed out and emptied three tea ships of their cargo. 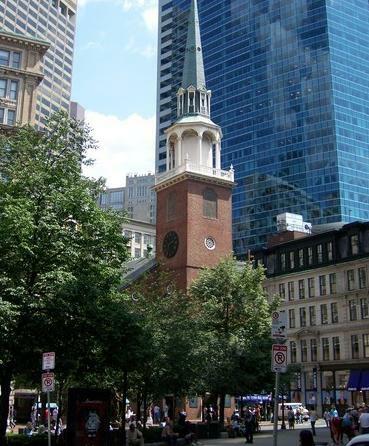 Today, the Old South Meeting House is a museum, with displays for each phase of the structure’s history. These include statues of some important people who have been involved in the history of the building. Margaret Sanger, the founder of Planned Parenthood, has been honored with a statue for her stance on freedom of speech. She wanted to speak at the meeting house, but the mayor of Boston prohibited her (and many others) from speaking because of her controversial views. In protest, she covered her mouth with a piece of fabric. I wonder what the curator’s thought process was when he or she chose to honor Margaret Sanger with a statue. Did the museum’s decision makers realize they were honoring a very evil person—one who sought extermination of an entire group of people? Why didn’t they honor the KKK members or someone else who was prohibited from speaking at the meeting house? As a museum customer, I was offended that someone so wicked had been honored with a life-size statue.